thriukkOshtiyUr is greatly glorified by periyAzhwAr in his periyAzhwAr thirumozhi 4.4 – nAva kAriyam padhigam. 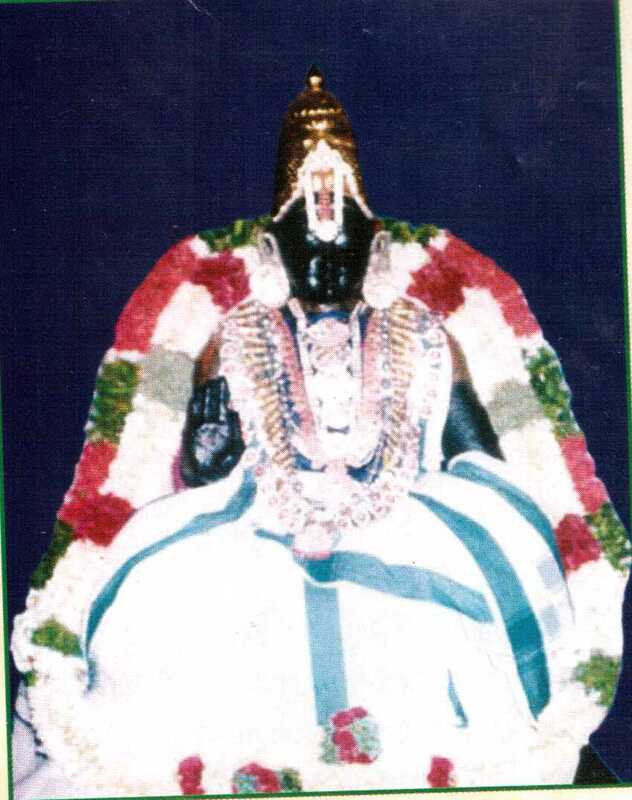 thirukkurugai pirAn, who was born in this beautiful dhivya dhEsam, becomes to be famously known as thirukkOshtiyUr nambi and is one of the prime sishyas of ALavandhAr. He is also known as gOshti pUrNar and gOshti purIsar. ALavandhAr instructs his 5 prime disciples to teach various aspects of our sampradhAyam to emperumAnAr. Of those, thirukkOshtiyUr is given the responsibility of teaching the meanings of rahasya thrayam – thirumanthram, dhvayam and charama slOkam. thirukkOshtiyUr nambi is the one who bestows the name “emperumAnAr” to srI rAmAnujar for his selfless act of sharing the meanings of charama slOkam with everyone who desired to learn that without any pre-conditions. nambi is constantly engaged in meditating on emperumAn through the divine meanings of rahasya thrayam (thirumanthram, dhvayam and charama slOkam) as he learnt from ALavandhAr and does not interact with anyone. In his own town (thirukkOshtiyUr) no one knew his glories. srI rAmAnujar, knowing the glories of nambi, walked 18 times from srIrangam to thirukkOshtiyUr to learn the most confidential meaning of charama slOkam. Finally at the 18th time nambi decides to instruct him the most confidential meaning of charama slOkam. nambi asks srI rAmAnujar to promise that he wont share this knowledge with anyone who is not qualified and who does not strive very very hard to know the same. rAmAnujar accepts that and promises at that time. nambi teaches the most confidential knowledge of charama slOkam. charama slOkam is gIthAchAryan’s “sarva dharmAn parithyajya” slOkam (gIthai – 18.66). In this slOkam, the most important principle is revealed through the word “Ekam” – which means only bhagavAn is upAyam. Any thing else such as karma, jnAna, bhakthi yOgams, our own prapathi (surrender), etc are not the real upAyam. This most confidential meaning when revealed to unqualified, can be easily misused in not performing ones own duties. So, the AchAryas until srI rAmAnujar protected it very carefully. But rAmAnujar, after learning this meaning from thirukkOshtiyUr nambi, immediately gathered the ones who were very eager to learn this secret meaning and explained the same in detail. nambi hears about rAmAnujar’s revelation and summons him at once. rAmAnujar arrive at nambi’s thirumALigai (residence). nambi enquires about rAmAnujar’s act and rAmAnujar accepts that he disobeyed his orders. When nambi asks why he did that, rAmAnujar says, “I may go to hell by disobeying your orders but many others (who learnt the meaning of charam slOkam) will get mOksham and be uplifted”. nambi becomes totally overwhelmed by rAmAnujar’s huge heart in providing true spiritual help to others and gives him a special name – emperumAnAr. emperumAn means my lord (bhagavAn) and emperumAnAr means one who is more merciful than bhagavAn. Thus, rAmAnujar becomes emperumAnAr after revealing the esoteric meanings of charama slOkam in thirukkOshtiyUr. This charithram (incident) is clearly and beautifully explained in mumukshuppadi vyAkyAna avathArikai (introduction) of maNavALa mAmunigaL for charama slOka prakaraNam (section). Note: In 6000 padi guru paramparA prabhAvam, it is explained that srI rAmAnujar learnt the meanings of thirumanthram from thirukkOshtiyUr nambi and revealed that and because of that nambi named him “emperumAnAr” and subsequently learnt the meanings of charama slOkam. But since mAmunigaL clearly explains that it is charama slOkam that was revealed by emperumAnAr and also since it fits many incidents in vyAkyAnams where “Ekam” shabhdham of charama slOkam is declared as the most confidential principle, we accept that as the authority (as heard from AchAryas). Here ANdAL is compared to nambi. Just like nambi did not reveal his bhagavadh anubhavam to others, it is said that ANdAL also does not want to reveal her anguish in separation from emperumAn to others. The local residents of thirukkOshtiyUr did not know the real greatness of nambi until srI rAmAnujar arrived there. When rAmAnujar arrived at thirukkOshtiyUr, he enquired about the residence of thirukkurugai pirAn (original name of nambi named after nammAzhwAr) and as soon as the particular direction was shown, he falls flat and offers his obeisances. The locals then understood the glories of nambi who was worshipped by rAmAnujar himself. It is highlighted that both mudhaliyANdAn and kUrathAzhwAn served 6 months at the lotus feet of nambi to get valuable meanings of our sampradhAyam. thiruviruththam 10 – nampiLLai svApadhEsam – Every time nambi visits srIrangam, while returning, emperumAnAr walks along with him upto mArAchchippuram (a place near srIrangam) to bid farewell. One such time, emperumAnAr asks nambi to give an instruction which he can contemplate on. nambi says “When ALavandhAr takes bath in the river, while he dips inside, his upper back portion is seen as the backside of kUrmAsanam (a seat which looks like tortoise’s shell). Even after ALavandhAr ascending to paramapadham, I always think about that vision of ALavandhAr’s upper back. You also contemplate on the same”. By this incident nambi shows that a sishya should be attached to AchAryan’s thirumEni (divine form) as much as his instructions and the knowledge. thiruviruththam 99 – periyavAchAn piLLai vyAkyAnam – AzhwAr says he accepts gyAnappirAn as the only upAyam. This explains the “Ekam” word in charama slOkam which eliminates all other upAyams and establishes emperumAn as the only upAyam. This is the most confidential principle of our sampradhAyam and was taught by thirukkOshtiyUr nambi to srI rAmAnujar. Once, during a visit to srIrangam for a uthsavam, nambi brings emperumAnAr into a secluded place in the srIrangam temple and starts explaining the meanings of Ekam. But then he notices a kainkaryaparar of the temple lying down in deep sleep and snoring. Immediately nambi retracts and says there is some one here and does not explain the meaning. But subsequently nambi instructs the meanings to emperumAnAr in once and informs emperumAnAr that he should also explain this to deserving persons only. emperumAnAr, in the bright noon time under the hot sun, runs to AzhwAn‘s residence and shares him the meaning as heard from nambi. Thus emperumAnAr proves sahakAri nairapEkshyam (not expecting any action from our part for the benediction) by sharing the meanings to AzhwAn without AzhwAn making any special efforts for that. thiruviruththam 95 – In this pAsura (yAthAnum Or Akkayil pukku pAsuram) vyAkyAnam, it is shown that one of the sishyas of nambi explains to nanjIyar that this is the favourite pAsuram of nambi. This pAsuram reveals the benediction and favours done by emperumAn even though the jIvAthmA is constantly engaged in materialistic activities. thiruvAimozhi 1.10.6 – nampiLLai vyAkyAnam – AzhwAr discusses with his nenjam (heart) in this pAsuram. To explain that, nampiLLai explains that since bhagavadh vishayam is a very superior subject and not everyone can understand it, just like nambi always contemplates it alone, AzhwAr is discussing bhagavadh vishayam with his own heart. thiruvAimozhi 8.8.2 – Once during a lecture of emperumAnAr, a question arises about the svarUpam (nature) of jIvAthamA. Is it gyAthruthvam (being the knower) or sEshathvam (being the servitor of emperumAn)? emperumAnAr instructs AzhwAn to enquire the meanings from nambi. AzhwAn goes to thirukkOshtiyUr and serves him for 6 months. Finally when nambi asks for the purpose of AzhwAn’s visit, AzhwAn explains the question. nambi simply says AzhwAr has established that “adiyEn uLLAn”, meaning jIvAthmA is adiyEn – servitor by nature. So, why is vEdhAntham talks about gyAthruthvam (being the knower)? That is because, knower here means knowing that he is the servitor of emperumAn. So the real svarUpam of jIvAthmA as explained by AzhwAr and thirukkOshtiyUr nambi is – jIvAthmA is the one who knows that he is subservient to emperumAn. thirukkOshtiyUr nambi establishing emperumAnAr’s glories is also explained in the divine grantham named charamOpAya nirNayam and it can be viewed at http://ponnadi.blogspot.in/2012/12/charamopaya-nirnayam-ramanujars-acharyas.html. When thirumAlai ANdAn stops the thiruvAimozhi kAlakshEpam due to some misunderstandings with emperumAnAr, nambi reconciles the issue and explains to thirumAlai ANdAn that emperumAnAr is an avathAra purusha who is fully knowledgable. He insists that the kAlakshEpam should continue and ensures that it happens. When emperumAnAr was once poisoned by some miscreants, emperumAnAr coming to know about that, starts fasting and does not consume any prasAdham at all. nambi arrives from thirukkOshtiyUr and emperumAnAr meets him on the banks of cauvery river on a hot day. emperumAnAr offers his sAshtAnga praNAmam (obeisances) to nambi on the hot sand and nambi keeps watching that. kidAmbi AchAn who is a sishya of emperumAnAr immediately lifts emperumAnAr up and challenges nambi on his act of making emperumAnAr stay on the sand for long. nambi immediately says that he was doing that to find out who is most attached to emperumAnAr’s thirumEni (divine form). nambi subsequently instructs kidAmbi AchAn to prepare the prasAdham for emperumAnAr regularly. Thus, we can see, nambi was very fond of emperumAnAr and was always looking out for the well-being of emperumAnAr. Thus, we have seen that thirukkOshtiyUr nambi’s glories are many and he was instrumental in srI rAmAnujar getting the most beautiful name “emperumAnAr” leading to our sampradhAyam being hailed as emperumAnAr dharisanam by namperumAL himself as shown by mAmunigaL in his upadhEsa rathina mAlai. Let us bow down at the lotus feet of thirukkOshtiyUr nambi who had great attachment towards ALavandhAr and emperumAnAr. This entry was posted in other AchAryas and tagged arayar ramanuja on February 27, 2013 by sarathyt. sri u ve dr V V R Swami’s lecture on Sri Tirukkoshtiyur Nambi in Sri Parthasarathi sannidhi explained nicely how Nambi was extremely fond of Emberumanar, though surfacially it appeared he was tough with the young Swami. He ensured Tirumaalaiyaandaan continued his vyaakhyaanams to Swami. He made Kidaambiyaachchaan permanantly take care of Swami’s bhiksha. He was the first to recognize Swami as emberumaanaar. nice deposition of Nambikal. polika polika polika….the two nambis, Tirukkachi and Tirukkoshtiyur gave the universe the abundant love of Swami. thank you swamy – infact adiyen missed couple of episodes involving nambi and emperumAnAr – since you have highlighted one, adiyen will add them as well. The compilation is really excellent. One point that could be highlighted or rephrased is as follows. Here As Much as should be replaced with More than his instructions and Knowledge imparted by him. The reason being, Maamunigal’s Varthai Of Thesarum Sishyanavan SeerVadivai Aaasaiyudan Nookumavanenum Noonarivai keetum Vaithum and Anushtanam of Pinpalagaram Perumal Jeeyar emobodies this principle. The phrase was trying to place Sishya’s Attachment on Acharyan’s SeerVadivu (Divine Form) in comparative degree rather than Superlative degree. Adiyen would also get this clarification from adiyen’s Acharyan. thanks for the feedback swamy. yes, “more than” sounds reasonable. but only thing is in that sentence “AchArya’s instructions” are also present – they are also of great importance as identified in srIvachana bhUshaNam, etc., that we should have full faith in their words and follow it sincerely.